Georges Seurat was born on December 2, 1859 in Paris, France. 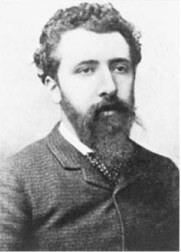 His father Antoine Chrysostom Seurat was a native to Champagne, and his mother Ernestine Faivre was a Parisian. He also had a brother and a sister, Emile and Marie-Berthe. Georges first studied art by taking drawing lessons with sculptor Justin Lequiene and then continued his education at the Ecole des Beaux-Arts in Paris. His first art studio was shared with two friends. Later he moved to a studio of his own. In 1883 Seurat devoted himself to his first major work - a huge painting titled Bathers at Asnieres. Unfortunately, the painting was refused for exhibition at the Paris Salon of 1884. After the rejection of his Bathers painting by the Salon, Seurat turned to the independent artists of Paris. In that same year he and other artists formed the Societe des Artistes Independants. It was during that time when he began to develop his ideas about pointillism. This new method of painting used dots instead of brush strokes to create the picture. He felt that this technique would make the colors more brilliant and powerful than those created with brush strokes. In the summer of 1884 Seurat began work on his large-scale pointillist work A Sunday Afternoon on the Island of La Grande Jatte. The painting took him two years to complete. 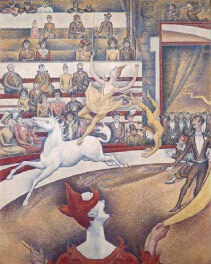 Georges Seurat died on March 29, 1891. He completed 7 large-scale paintings and about 500 smaller ones during his lifetime. His most important works include Bathers at Asnieres, The Circus and A Sunday Afternoon on the Island of La Grande Jatte, which is considered his most celebrated work.